Leigh's Fiber Journal: Got Sheeps? Tina (A Blip on the Radar) did a very sweet thing this year and sent out Valentine's gifts, of which Rascal and I were lucky recipients! 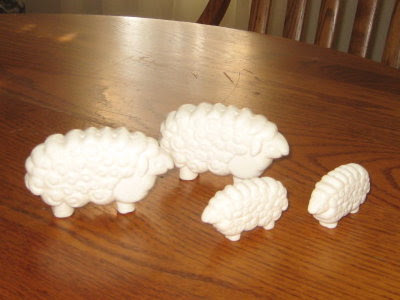 We got quite a few goodies, but this is the one I absolutely had to share with you, sheep soaps. Aren't they neat? They are definitely "do not use" soaps and deserve special display in my bathroom. Now you have a flock of sheep. It's low maintance flock. lol! I have a couple of border collie wanna be's to keep these sheepies in line! So cute! I just love sheep! She sent me a box too, Leigh! Isn't she just wonderful???!!!! Very sweet!!!! They sure look nice in your bathroom. That's my kind of flock of sheep - it doesn't need fed or cleaned up after!